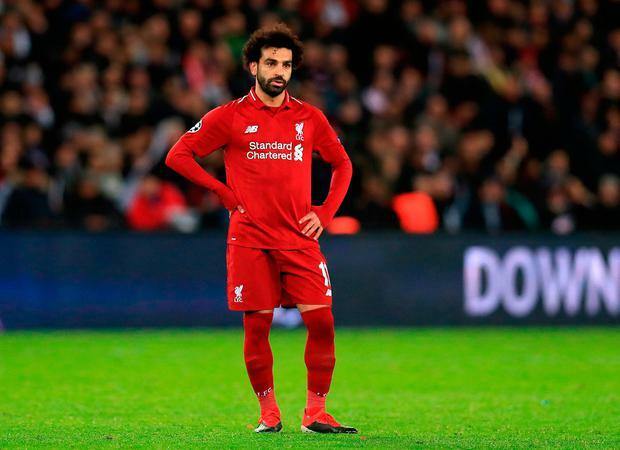 Liverpool's Mohamed Salah stands dejected during the UEFA Champions League, Group C match at the Parc des Princes, Paris. PRESS ASSOCIATION Photo. Picture date: Wednesday November 28, 2018. See PA story SOCCER PSG. Photo credit should read: Mike Egerton/PA Wire. Jurgen Klopp's side have to beat the Serie A side by more than one goal to ensure progress to the knockout stage having suffered a fourth successive Champions League away defeat - this being the first time they have lost all three away group games. Juan Bernat and Neymar, whose 31st goal in the competition saw him leapfrog Kaka as the top-scoring Brazilian, put the hosts ahead before James Milner's penalty on the stroke of half-time offered hope. But despite an improved second-half performance Liverpool could not find an equaliser, leaving themselves with it all do in what is certain to be a highly charged occasion in a fortnight's time. Having overpowered PSG at Anfield they will hope to do the same to the Italians but there was no rolling over their French opponents in their own backyard. Marco Verratti was injured for the previous meeting but he set about making his mark - quite literally at one point, with an ugly lunge on Joe Gomez which should have resulted in a red card - from the off. The Italy midfielder, reassured by Marquinhos holding the ground behind him, was soon pulling the strings with an early Kylian Mbappe shot deflected wide and an Angel Di Maria volley tipped behind by Alisson Becker. In September Liverpool had swamped their opponents in the middle of the pitch but it was a completely different story in the French capital with PSG holding all the cards. With Neymar, playing wide on the left of a midfield four, exciting and infuriating in equal measure with his quality and overacting Liverpool were under the cosh and the pressure told as early as the 14th minute. An uncharacteristic error by Virgil Van Dijk saw the Holland defender half-clear Mbappe's shot to Bernat and he cut inside to squeeze a right-footed shot between the closing Joe Gomez and Jordan Henderson with the ball taking a deflection off the defender. For all his rolling-around antics Neymar can turn it on in a flash and, having collected the ball 25 yards inside his own half, he shook off compatriot Roberto Firmino and exchanged passes with Mbappe before releasing his pacy team-mate down the left. But they were given a lifeline on the stroke of half-time when Mane robbed Marquinhos, who up to that point had been commanding, and was brought down just inside the penalty area by a lunging Di Maria. Polish referee Szymon Marciniak initially pointed for a corner, but having presumably received some advice from his fellow official behind the goal, changed his mind and awarded a penalty which Milner dispatched against a cacophony of whistles and jeers. Liverpool began the second half with much more fight, finally taking the game to PSG, and boss Thomas Tuchel was concerned enough to replace midfielder Di Maria with defender Dani Alves and Cavani with the arguably less-talented but more energetic Eric Choupo-Moting. But for all their pressure they could not crack their opponents, who used every trick in the book to take time out of the game when they were wobbling, and it was the hosts who had the best chance with Alisson saving Marquinos' header. It is not what Klopp would have wanted having been top of Group C at the halfway stage but another electric Anfield night awaits.